Performance road cycling ranks as the #1 choice among people pursuing an active lifestyle and seeking new travel experiences. In other words, cycling is the new golf. At the forefront of this movement is the just launched Over The Top Travel, offering world-class performance cycling experiences for people who love to ride. What sets Over The Top apart is its focus on the cycling experience. As owner Greg Pruner, a passionate cyclist who’s ridden France’s famous Mt. Ventoux three times in one day, says, “We are the answer for avid riders looking for a cycling experience that combines fulfilling rides with the best of world-class destinations. We don’t do three-hour lunches or afternoon museum tours. We ride.” Many of Over The Top’s guides are certified coaches there to help and support cyclists with techniques to improve their riding, if they so desire. In addition to being an experienced cyclist, Pruner is also a certified sommelier. He spent many years living in Europe sampling the best cuisine on offer, which accounts for Over The Top’s other main ingredients: “Apres Vélos” featuring Michelin-star dining and expertly selected wines. Upcoming 2012 riding destinations include many of the classics such as the Pyrenees, the French Alps, Tour de France and a destination at the of top of every serious cyclist’s list: Mallorca. On the beautiful Mediterranean island of Mallorca, Over The Top will feature its Spoke Club series which caters to avid cyclists and their non-riding partners. It is part spring riding camp, part retreat and part culinary and cultural adventure. Over The Top is also offering a unique Women’s Road Cycling Retreat from February 26 to March 2, 2012. Set in the gorgeous Miraval Resort in Arizona, this one-of-a-kind retreat is ideal for women cyclists looking to improve their riding skills and confidence in an open and relaxing environment. Over The Top — the premier provider of world-class performance cycling experiences for people who love to ride — combines the best of each destination’s cuisine, culture and breath-taking landscapes, with performance cycling adventures. Visit www.overthetoptravel.com to learn more. Looking for winter fun, a true Alaska experience and a dash of adventure? Three huge events spice up late February and early March in Anchorage. Spanning 10 days, Anchorage Fur Rendezvous, the ceremonial start of the Iditarod Trail Sled Dog Race® and the Tour of Anchorage fill the city with winter activities to suit any interest. From February 24 to March 4, 2012, Anchorage Fur Rendezvous, or “Rondy” as it’s known locally, features dozens of events that make the most of the Alaska winter. Wild events like outhouse races, the Frostbite Footrace, snowshoe softball and Yukigassen – a team snowball fight tournament – mean lots of fun and plenty of friendly competition for bragging rights. This year, Rondy marks the fifth annual Running of the Reindeer. In which participants make a mad dash down Fourth Avenue alongside live reindeer. Rondy also is home to the World Championship Sled Dog Races, the premier short-distance sled dog race. But just as Rondy reaches its pinnacle, another event – perhaps the most iconic Alaska event – kicks off in Anchorage. The 1,049 mile Iditarod starts in downtown Anchorage on March 3, 2012, as mushers, dogs and sleds line Fourth Avenue and spectators pack the sidewalks in anticipation of the “Last Great Race.” After a mile and a half on city streets, the course speeds through forested trails, greenbelts and parks of Anchorage. But this is merely the beginning; in the days ahead, mushers face daunting terrain, treacherous weather and vast wilderness on their way to Nome. But even after the last team has left Anchorage, the weekend holds another big event. See the city of Anchorage and get a good workout in the process. On March 4, 2012, the annual Tour of Anchorage takes full advantage of the city’s vast trail system for the ultimate cross-country skiing event. 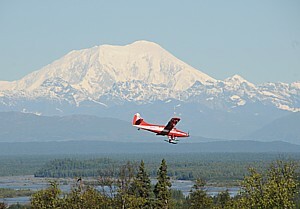 Part of the American Ski Marathon Series, North America’s longest running and largest citizen’s racing and touring series, the Tour of Anchorage also celebrates its 25th year in 2012. With 50K, 40K and 25K routes, it’s all about endurance. Whether speeding to the finish line or taking a more leisurely pace, the Tour of Anchorage is a great way to experience Alaska through the trail system. For more information on Anchorage’s wild adventures and urban delights, visit www.Anchorage.net. The Cervélo Pro Travel Experience is a travel experience like no other, designed entirely for and with minute attention to the passionate cyclist. Two iconic Canadian companies, both uncompromising innovators in their respective fields of active travel and performance bikes, have combined forces and expertise to create a series of cycling travel packages built around the experience of pro cycling. Both Cervélo and Butterfield & Robinson are respected for their unwavering pursuit of excellence, innovation and customer care. Performance bike manufacturer Cervélo literally, “brain bike”set the pro cycling world afire 16 years ago when they introduced a revolutionary new design to the time trial bike market. In 2009, Cervélo became the first bike manufacturer in the modern era to have its own cycling team at the highest levels of racing. Cervélo’s partner for their travel venture are active travel experts Butterfield & Robinson, who have been operating upscale biking and walking journeys across the globe since 1966. B&R pioneered “active travel,” and their intense focus on delivering superlative experiences to their customers, combined with intimate local insights. Trips will be offered around race events offering interaction with pro-cyclists. Paris-Roubaix, Amstel Gold Cup, Liege-Bastogne-Liege, Giro d’Italia , the Amgen Tour of California, The Tour, the USA Pro Cycling Challenge, the Grand Prix Cycliste de Quebec and the UCI Road World Championships. Other trips are based around iconic rides such as: the French Alps, the Pyrénées, the Cols of Provence, Santa Barbara and the Italian Alps. All riders will be provided with Cervélo gear and a custom fitted Cervélo R3 team bike. They will also have the opportunity to test ride a Cervélo S5 aero bike and enjoy soigneur services (e.g. pre and post ride massages). Both companies believe passionately in the relentless pursuit of excellence whether on the track, on the road, or around the dinner table. These trips bring a combination of cutting-edge bicycle engineering and envelope-pushing travel artistry; delivering finely balanced and completely unique once-in-a-lifetime experiences. Orlando’s luxurious Rosen Shingle Creek is once again creating plenty of ways for locals and visitors to capture the spirit of the holiday season. For the fourth year, the luxurious AAA Four Diamond hotel will offer its one-of-a-kind series of holiday events spanning Thanksgiving to New Year’s Eve. New events, including spirited song and dance performances, as well as choral concerts by school and church groups, have been added to this year’s bustling holiday line-up, which includes a Sugar Plum Afternoon Tea and a and visit from the Sugarplum Fairy, live performances of excerpts from “The Nutcracker,” visits from Santa Claus, Thanksgiving and Christmas Day buffets, an elegant New Year’s Eve dinner, and more. All of the events, with the exclusion of the buffets at Thanksgiving and Christmas, the Holiday Chocolate Making Workshop and the Sugar Plum Afternoon Tea, are offered at no charge and are open to all who care to share in the spirit of the holidays. For more information or to make reservations for ticketed events, call 407-996-9770 or visit http://www.rosenshinglecreek.com/holidayseason. Rosen Shingle Creek invites both locals and visitors to step out of their kitchens and into the hotel’s beautiful Café Osceola to enjoy sumptuous holiday brunch buffets on Christmas Day, Dec. 25. Here, guests’ only job will be to fill their plates with an incredible smorgasbord prepared by the award-winning chefs at Rosen Shingle Creek. The menu will include traditional meats such as roasted turkey and pork tenderloin, delicious seasonal side dishes featuring flavors of cranberry and pumpkin, as well as non-traditional fare such as seafood, sushi and a pasta station. The finale includes an extravaganza of desserts including a chocolate fountain, pies, pastries, muffins and breads from world-renowned Executive Pastry Chef, David Ramirez, and his team. The all-you-care-to-eat buffet will be offered Christmas Day 11:30 a.m. to 7 p.m. Tickets are $55.95 for adults, plus tax and gratuity; $24.95 for children ages 4-12, plus tax and gratuity. * Florida residents enjoy 25 percent off holiday buffets. For reservations, call 407-996-3663. Storybook fantasies come to life at Rosen Shingle Creek’s Sugar Plum Afternoon Tea, held Sunday, Dec. 4 from 2 to 4 p.m. in the hotel’s main lobby. “Visions of sugar plums” won’t just be dancing in their heads, but right in front of their eyes, as guests of all ages enjoy a special afternoon visit with the Sugar Plum Fairy. The stunning costumed character will pose for photos, sign autographs and mingle with guests from 2:30 to 3:30 p.m. as they enjoy a traditional English-style tea service with a deluxe assortment of sandwiches, imported teas, lemonade and fabulous desserts. Each child will receive a complimentary tea hat, and each guest will receive a complimentary photo and novelty holiday frame by which to remember this special day. A wonderful holiday tradition to begin with grandmothers, moms, daughters, sisters, or girlfriends, the Sugar Plum Afternoon Tea costs $15 per person plus tax for guests age 4 and older. Children under 4 are free. To purchase tickets, call 407-996-9770. Reservations are suggested. Chocolate lovers young and young-at-heart will enjoy an afternoon creating holiday treats featuring their favorite sweet with “Orlando’s Willy Wonka” Executive Pastry Chef David Ramirez. On Sat., Dec. 10 from 2 to 4 p.m., Chef David and his team will show guests how to bring Sugar Plum Fairies and other cherished holiday icons to life in the form of chocolate. Guests will enjoy sampling treats, as well as creating their own chocolate-themed gifts they can bring home after the workshop. 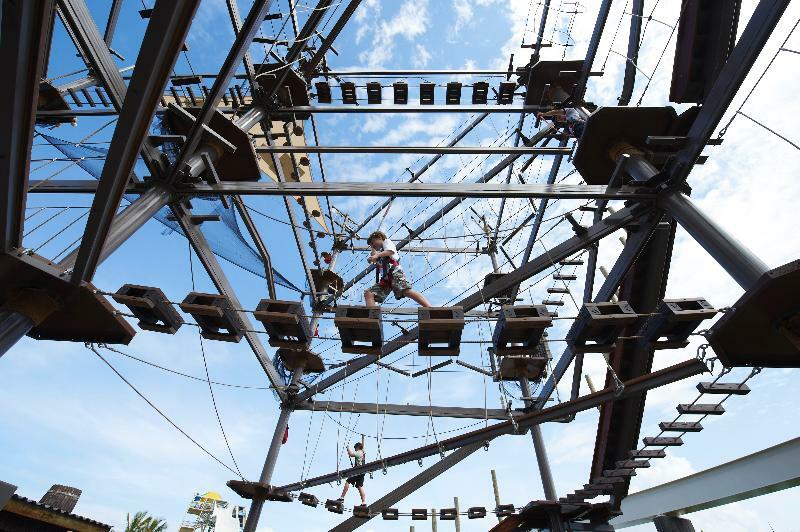 The event is open to the entire family and is $15 per person plus tax for all ages. To purchase tickets and for more details, call 407-996-9770. Reservations are suggested. Holiday Chorus: Nothing creates a festive mood like the sound of Christmas carols, and Rosen Shingle Creek will come alive with holiday music each Thursday evening, Dec. 1, 8 and 15 at 6 p.m., as local school and church choirs perform classic selections by the fireside in the hotel lobby. “The Nutcracker:” Each Friday evening, Dec. 2, 9 and 16, beginning at 6:30 p.m., “The Nutcracker” comes to life at Rosen Shingle Creek as excerpts from the beloved holiday ballet are performed in front of the hotel’s grand fireplace by members of the Elizabeth Parsons School of Dance, Windermere Ballet and Community Dance Theatre. Visits from Santa Claus: While the elves are busy at work at the North Pole, Santa Claus will be dropping in to enjoy some R&R at Rosen Shingle Creek. 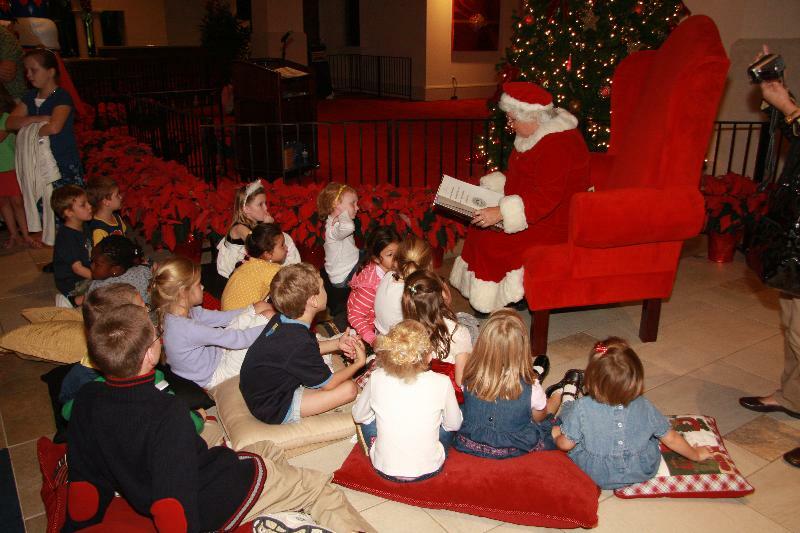 Santa will take photos with hotel guests and visitors on Friday, Dec. 2, 9 and 16; and Saturday Dec. 3, 10 and 17, from 6 p.m. to 7:30 p.m. in the hotel lobby. A Dancing and Singing Holiday Special: Spreading holiday cheer, the S.O.D.A. P.O.P.s, presented by Miriam and Valerie’s School of Dance Arts, will provide contemporary holiday dance entertainment on Saturday, Dec. 3, 10 and 17 at 6:30 p.m. in the hotel lobby. Holiday Photographs: Each Friday and Saturday night, from Dec. 2 to 17, in the hotel lobby, photographer Dan Higgins will offer guests affordable holiday photo packages. Guests who dine at Rosen Shingle Creek on the evenings of the Friday and Saturday night performances may purchase two entrees and get one free at Café Osceola. This offer is valid through Dec. 17 and cannot be combined with other discounts or promotions. Special discounted room rates will be offered both Friday and Saturday nights (depending on availability). * While staying at the hotel, guests are also invited to begin their holiday shopping, with opportunities to purchase gift cards for overnight stays as well as Rosen Shingle Creek’s award-winning restaurants, world-class spa and championships golf course. The 1,500-room Rosen Shingle Creek is conveniently located at 9939 Universal Blvd., just off the International Drive tourist district and ten minutes from the Orlando International Airport. For more information, visit www.rosenshinglecreek.com or call (866) 996-9939. Snowboarding at Watervill Valley, New Hampshire. Ski NH is introducing a new lift ticket package just in time for holiday shopping. Holiday 2-Packs, available for a limited time from November 28 through December 21, offering a savings of $11-$20 off weekend/holiday lift tickets. Tickets are fully-transferable, making them an excellent gift idea for family, friends or even the gift giver © 2011 Karen Rubin/news-photos-features.com. Ski NH is introducing a new lift ticket package just in time for holiday shopping. Holiday 2-Packs, available for a limited time from November 28 through December 21, offering a savings of $11-$20 off weekend/holiday lift tickets. Tickets are fully-transferable, making them an excellent gift idea for family, friends or even the gift giver! The Holiday 2-Pack consists of two or more fully transferable lift tickets which are valid any day during the 2011-12 ski season, including holidays and weekends. Tickets are available in six different price categories: $20, $30, $43, $54, $56 and $66 per ticket. Purchasers must select at least two different ski areas. 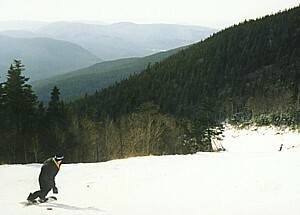 Ski areas included in the offer are Loon Mountain, Bretton Woods, Attitash Mountain Resort, Wildcat Mountain, Cannon Mountain, Waterville Valley, Mount Sunapee, Gunstock Mountain Resort, Cranmore Mountain, Pats Peak, Crotched Mountain, Ragged Mountain, Black Mountain, King Pine Ski Area, Dartmouth Skiway, Balsams Wilderness, Granite Gorge, and McIntyre Ski Area. Since there are limited ticket quantities available, skiers and riders should make their purchase sooner than later to be sure to get their favorite ski areas. For details on Ski NH’s Holiday 2-Packs and order forms, visit http://www.SkiNH.com or call 800-88-SKI-NH (800-887-5464). Ski NH is the statewide association representing 38 alpine and cross country resorts and more than 200 lodging and guest service properties in New Hampshire. For more information on ski areas, lodging packages, and winter events at Ski NH resorts, call Ski NH at (800) 88-SKI-NH (800-887-5464) or visit the Ski NH website at http://www.SkiNH.com. Louise Mandrell’s Christmas Dinner Party, part of Gaylord Opryland Resort's Country Christmas, combines a traditional holiday meal with performances by Louise Mandrell, her band and special guest Christy Sutherland © 2011 Karen Rubin/news-photos-features.com. Nashville’s iconic Gaylord Opryland Resort kicked off its 28th annual A Country Christmas tonight in a festive celebration featuring Shrek, Alex the Lion, King Julien, Po the Panda, Puss in Boots and a host of other lovable characters from DreamWorks Animation SKG, Inc. (Nasdaq: DWA). Presented by Coca-Cola, A Country Christmas runs Nov. 18, 2011 through Jan. 3, 2012, and includes the 10th anniversary edition of the Radio City Christmas Spectacular starring the world-famous Rockettes; ICE! featuring DreamWorks Animation’s Merry Madagascar; Louise Mandrell’s Christmas Dinner Party; the all-new Holly Jolly Town Square; Treasures for the Holidays craft show; 2 million twinkling lights and more. A Country Christmas has been hailed as one of the “Ten Great Places to Catch up with Santa” by USA Today; “The Most Christmassy Hotel in the Nation” by the Travel Channel’s Extreme Christmas; one of the top ten places to spend Christmas in the world by Travel + Leisure and a “Nashville treasure” by Southern Living. New for 2011 is a special Christmassy DreamWorks Experience vacation package that, for the first time ever, will provide DreamWorks fans with an up-close and personal experience with characters in a resort environment. Available for one-night with rates starting at $149*** per person and two-nights, with rates starting at $199*** per person, the package includes a series of exclusive offerings. • ICE! featuring DreamWorks’ Merry Madagascar. DreamWorks package guests receive priority access and early admission to this life-sized winter wonderland hand-carved from 2 million pounds of ice and themed to reflect DreamWorks’ Merry Madagascar. These hilarious and colorful displays, hand carved by 40 artisans from Harbin, China, depicts the holiday television special and features such scenes as Santa and his reindeer crash-landing on the island of Madagascar, and how Marty, Alex, Gloria and Melman hatched their scheme to save Christmas. • ShrekFeast Interactive Character Meals* feature delectable menu items only an ogre would love. Fairytale photo opps will abound as kids dine with Shrek, Princess Fiona and Puss in Boots, and discover a Magic Fountain bubbling over with chocolate potions. • DreamWorks “Character Passport” Meet & Greets* offer a chance for enthusiasts to stroll through Shrek and Princess Fiona’s beloved swamp for a face-to-face encounter with the green ogres; explore the island of Madagascar, that Alex the Lion, King Julien and the Penguins call home; and discover China’s ancient Valley of Peace where Po has become a true kung fu master. Guests can even meet the star of DreamWorks’ newest film – Puss In Boots! • Puss in Boots Quest for the Magic Beans Scavenger Hunt* creates fun for the entire family. Everyone will enjoy searching the expansive, indoor atriums at Gaylord Opryland on this interactive scavenger hunt. Answers can be entered online to win the grand prize! • Family Photo* A professional photo of each family with their favorite DreamWorks character will be taken and provided to them as a special keepsake of their Gaylord Hotels Christmassy DreamWorks Experience. • DreamWorks Character Wake-Up Calls* The immersive experience continues with a wacky wake-up call from one of the DreamWorks characters. Guests can choose from a host of their favorites for a fun way to start the day! Children will also enjoy Gingy’s Gingerbread Decorating and the DreamWorks’ Holiday Shrektacular, where families are invited to join the DreamWorks characters for a festive gathering with music, lights, dancing, and merriment in Gaylord Opryland’s Delta Atrium. The 2,881-room resort is transformed into a holiday wonderland with all of the sights and sounds of the holiday season. Twinkling lights, exquisite decorations and trees and special entertainment around every corner add to the excitement of A Country Christmas. Audiences can experience the magic of Christmas like never before with an all new production of the Radio City Christmas Spectacular®, starring the world-famous Rockettes®. America’s favorite holiday show—celebrating its 10th year in Nashville at the Grand Ole Opry House—is re-defining spectacular with dazzling brand new Rockette numbers and beloved favorites like the Parade of the Wooden Soldiers and the Living Nativity. Louise Mandrell’s Christmas Dinner Party combines a traditional holiday meal with all the trimmings with sensational and awe-inspiring performances by the multi-talented Louise Mandrell, her band and special guest Christy Sutherland. With favorite Christmas songs and dizzying dance routines, Louise wows audiences with her boundless energy in the new show she has created for her final holiday season at Gaylord Opryland. All new this year is Holly Jolly Town Square, a step back in time to a nostalgic 1950s town square, complete with all the shops from main street, a holiday kids train, story time with Mrs. Claus at the library, live entertainment, the Hall of Trees display benefiting local charities and more. For the first time ever, admission is free for Treasures for the Holidays, a festive craft and gift show featuring more than 40 unique merchants from across the country. The festivities continue aboard the General Jackson Showboat, one of the largest showboats in the country, with two Christmas cruise experiences. Fun-filled performances, chef-prepared meals and sweeping views of the Nashville skyline await guests on both the evening show, A Country Christmas on the Cumberland, and the mid-day holiday-themed show featuring Steve Hall & Shotgun Red. Ticket and package information is available at www.ChristmasAtGaylordOpryland.com or 1-888-999-OPRY (6779). Gaylord Opryland Resort & Convention Center, located at 2800 Opryland Drive in Nashville, Tenn., is the largest non-gaming hotel facility in the continental United States and the flagship property of Gaylord Hotels, owned by Nashville-based Gaylord Entertainment (NYSE: GET). The newly-renovated resort features 2,881 rooms and more than 600,000 square feet of meeting, convention and exhibit space. The property is best known for its signature glass roofs and nine acres of lavish indoor gardens and waterfalls. For more information, visit http://www.gaylordopryland.com or call 1-888-999-OPRY.